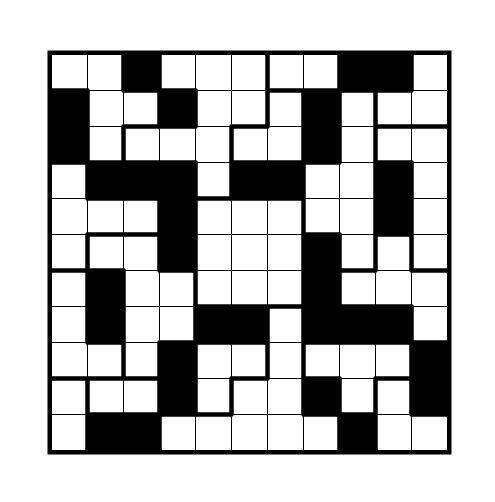 Author/Opus: This is the 13th puzzle from guest contributor Bryce Herdt. 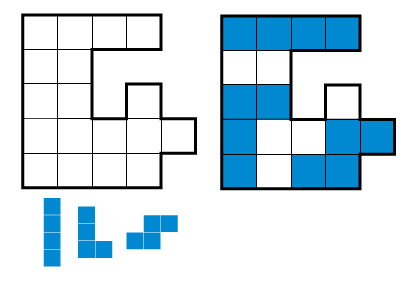 Answer String: Enter the length in cells of each of the shaded pentomino segments from left to right for the marked rows, starting at the top. Separate each row’s entry from the next with a comma. 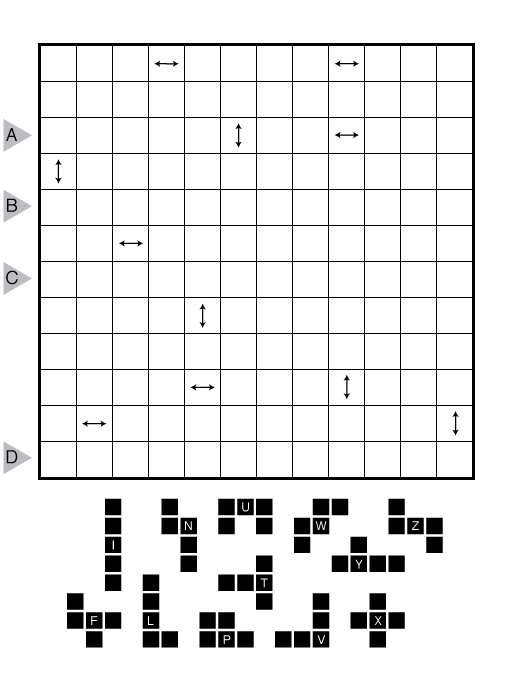 Author/Opus: This is the 141st puzzle from our contributing puzzlemaster Prasanna Seshadri. 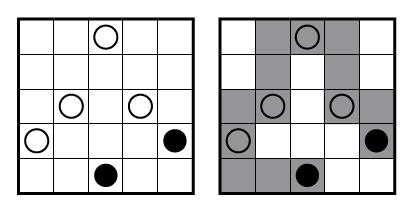 Rules: Place six pentominoes into each of the two top grids so that all twelve pentominoes are in one of the grids. 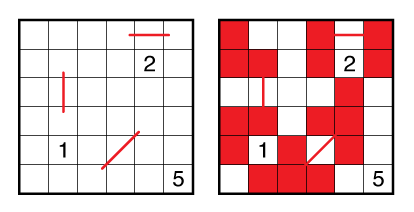 Pentominoes can be rotated and reflected, but cannot touch each other not even diagonally. 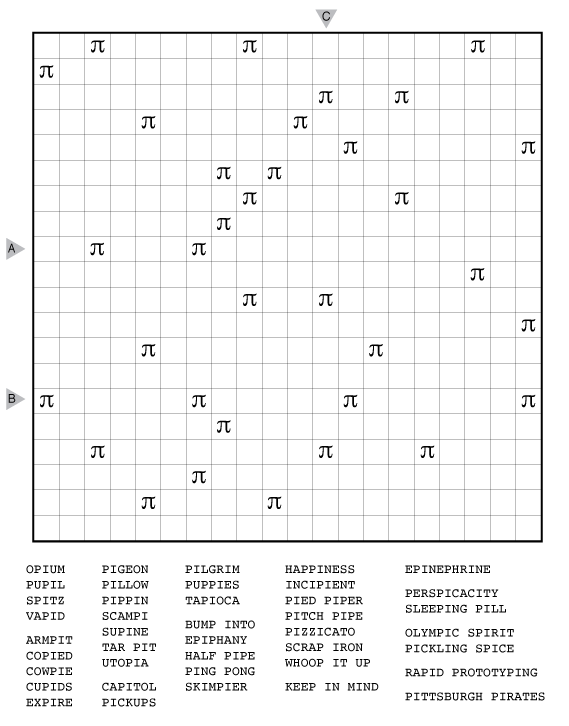 The numbers outside the grids indicate how many cells are used by pentominoes in that row/column. 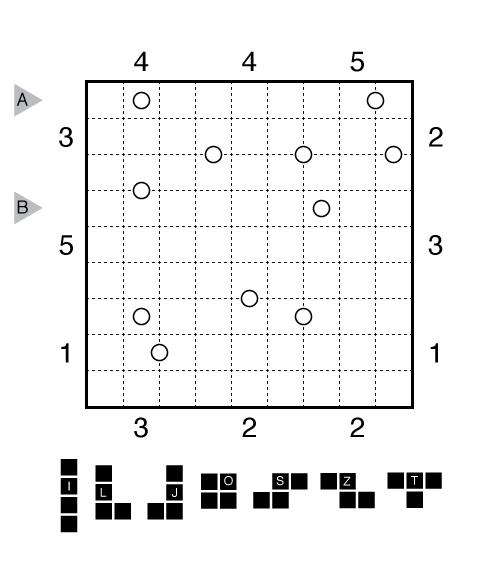 The shaded cells in the bottom grid must be part of a pentomino in one of the two top grids; the unshaded cells cannot be part of a pentomino in either grid. 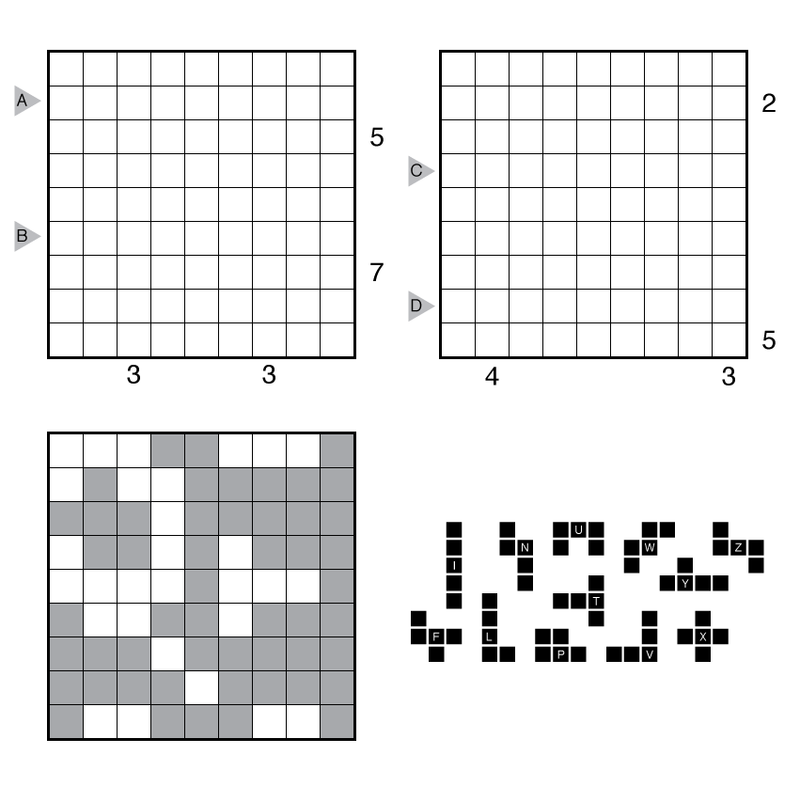 Answer String: Enter the length in cells of each of the shaded pentomino segments from left to right for the marked rows, starting with the two marked rows in the left grid and then with the two marked rows in the right grid. Separate each row’s entry from the next with a comma. 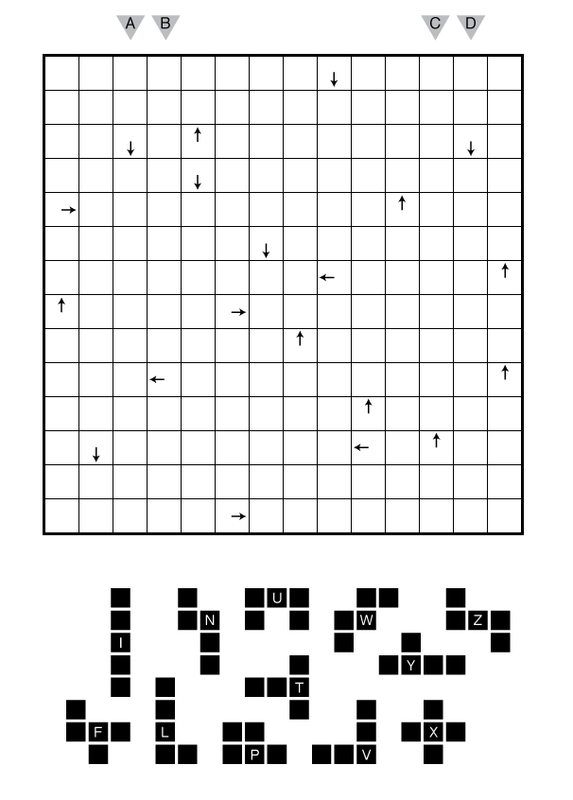 Note: Follow this link for other puzzles involving Pentominoes. 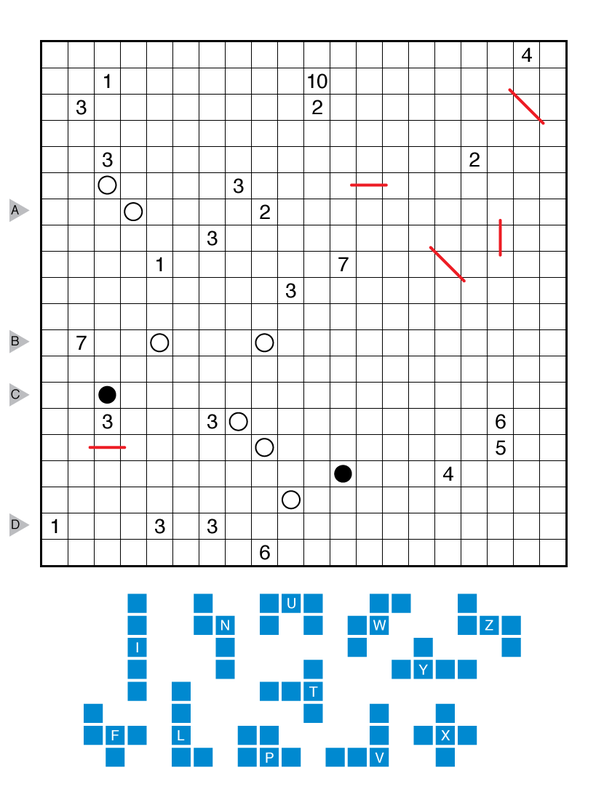 Author/Opus: This is the 135th puzzle from our contributing puzzlemaster Prasanna Seshadri. Rules: Add a light bulb to exactly one cell in each bold bordered white cell region so that each white cell is lit up. Each light bulb illuminates the cell it is in, as well as any horizontally and vertically adjacent cells, stopping at any black cells. No bulb can illuminate another bulb. Answer String: For each row from top to bottom, enter the number of bulbs in that row. Enter these numbers as a single string with no separators.